I usually don't do DIY posts, but I decided to post this one anyways, just because I'm proud of them. I recently made these pins and keychains for my friends, each one a different planet. I made 9 planets because I included pluto. I am aware that pluto is now classified as a dwarf planet, but I grew up during the time in which pluto was classified as the ninth planet in the solar system, so it feels wrong not including it. 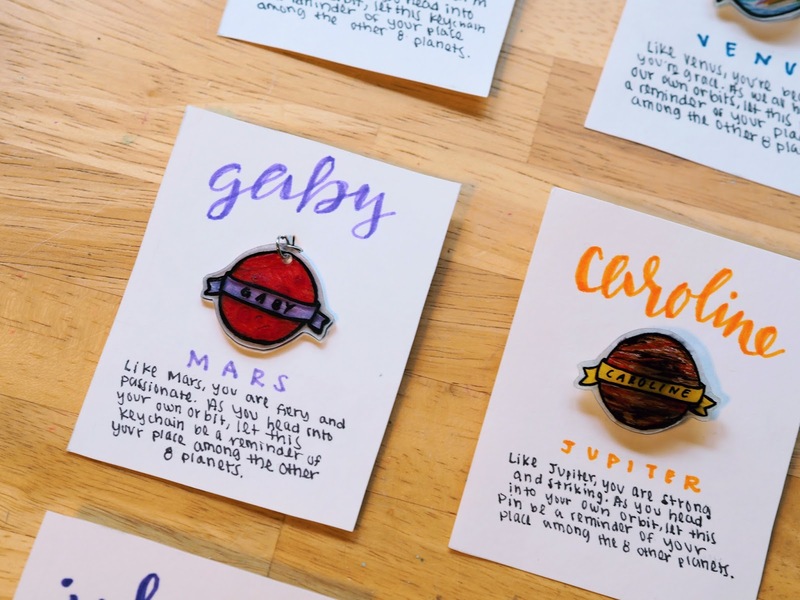 Not to mention, I have 8 friends that I wanted to make these pins and keychains for, so there are 9 planets including me, which allowed for it to be the perfect number of pins. I was trying to come up with a gift idea to give some of my friends for a while. I wanted something that was a) cheap, b) an easy DIY, c) usable, d) cute, and e) symbolic. I knew that I wanted to make assorted keychains and pins because they're usable and cheap. In addition, whether or not people got pins or keychains could be easily changed so that its use can fit the person. However, I struggled for a while coming up with what to make them of and how to make them. I don't know how I came up with the planet idea, but it was absolutely perfect. 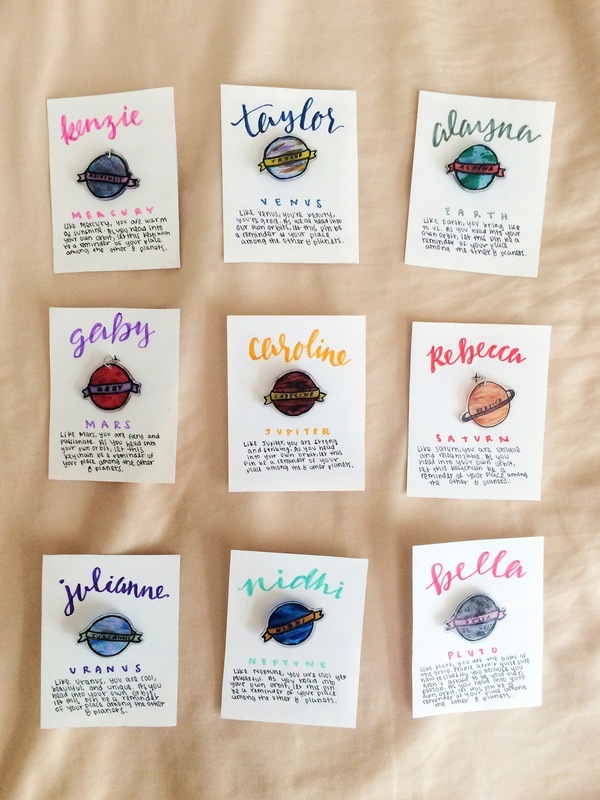 The message behind these planet keychains/pins is that each person has their own individual and unique gift that says something about their personality, it is something that can stand alone, just like we can. However, when you look at them, they prompt the reminder that it is a part of a group, there are other planets as well. Although everyone has their own orbit, you can still find a place where you belong among the other 8 (since we're counting Pluto) planets. These keychains and pins were super easy to make and I think that they turned out sooo good. 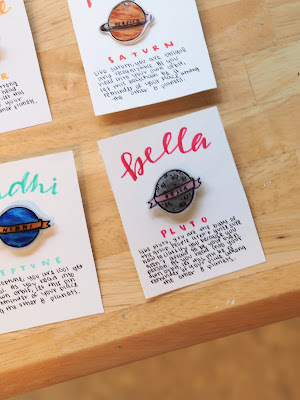 While they might not look as professional as an enamel pin or a metal keychain, these are a lot more do-able for a DIY and are still very cute. I did end up using Shrinky Dink plastic, which is intended for kids to use, but it worked really well for making these pins and keychains. If you want to make them for yourself or you're just curious, here are the instructions. Step One (optional): Make a shrinky ruler. One thing I was worried about was knowing how big to draw each of the planets so that they would turn out the correct size once they shrunk. I found a recommendation on Pinterest to make a ruler on the plastic and then shrink it so that you know how big you should draw your pin/keychain. I made a ruler on the plastic with centimeters and then shrunk it. 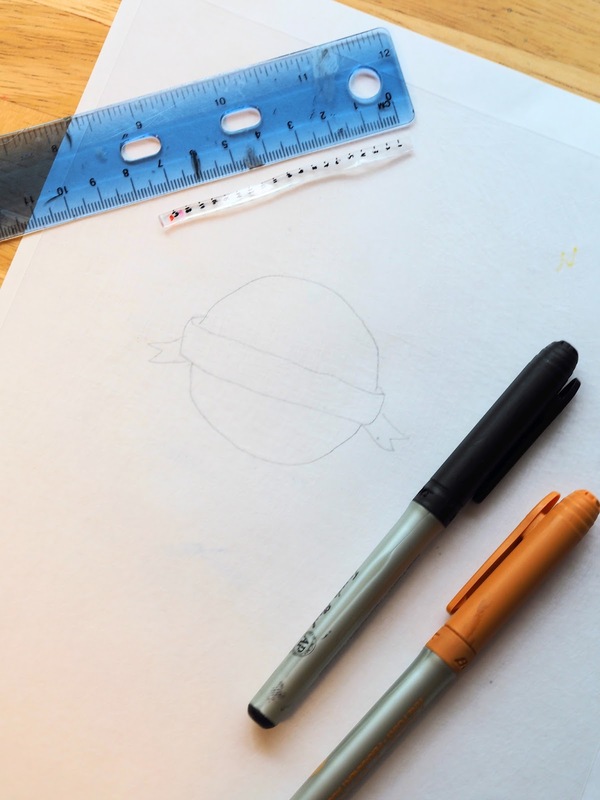 After that, I drew a little sketch of a planet around the size that I wanted the final product to be and measured it. The one I drew was a circle a diameter of approximately 5.5 mini-centimeters (the amount of centimeters that the shrunken ruler read), which meant that I needed to draw the planet as a circle with a diameter of 5.5 (real) centimeters. This yielded planets that had diameters of approximately 2.25 real centimeters after they shrunk. Step Two: Sketch your planet template on paper. I sketched out the circular shape of the planet on a sheet of plain white printer paper and then drew the banner on top of it. Since the Shrinky Dink plastic is clear, I could put the plastic over the sheet of paper in order to use it as a template. I did not sketch out any of the designs of the planets in terms of their colors, I improvised that. Step Three: Draw and color the planet on the Shrinky Dink plastic. With the help of the template, sketch out the shape of the planet and banner with a permanent black marker on the Shrinky Dink plastic. Color the planet accordingly, use pictures online to color the planets. I used a mix of permanent markers and colored pencils since I don't have a large variety of permanent markers. Permanent markers generally turn out the best though, just keep in mind that they tend to get darker upon baking. Step Four: Cut out your planet(s) and hole punch them (if making keychains). I cut out the planets with a border of plastic around them, but you can cut on the lines, it depends on the look that you want for your pins/keychains. If you are making a keychain, don't forget to use a hole punch to punch a hole into your plastic. You can use a regular hole punch, it will turn out the perfect size after shrinking. Step Five: Shrink those planets! Follow the Shrinky Dink instructions for baking the Shrinky Dink paper. After you take out the shrunken Shrinky Dink, make sure to press down on them while they're still warm if they are not completely flat. Step Six: Turn it into a keychain or a pin. Use super glue or a hot glue gun to attach the pin backing to the planet. Use a pair of pliers to attach the jump rings to the hole on the planet. I made a link of 7 rings before attaching the key ring. Step Seven (optional): Make the pin backing card. When you buy enamel pins, they generally have these backing cards attached to them, which is what I tried to make. For these, you can see that I added the gift recipient's name to the top of it, the planet name, and also a little description of why that planet fits them. This is much more functional to if you're making pins, but I still attached the keychains to a backing card by cutting a hole in them and putting the keychain through it so that they all have the same look. Like Mars, you are fiery and passionate. As you head into your own orbit, let this (keychain/pin) be a reminder of your place among the other 8 planets. So cute! This is a great gift for a group of friends and they would be fun party favors. Your handwriting is beautiful! I made them for my friends and they really loved them! And thank you Madison!